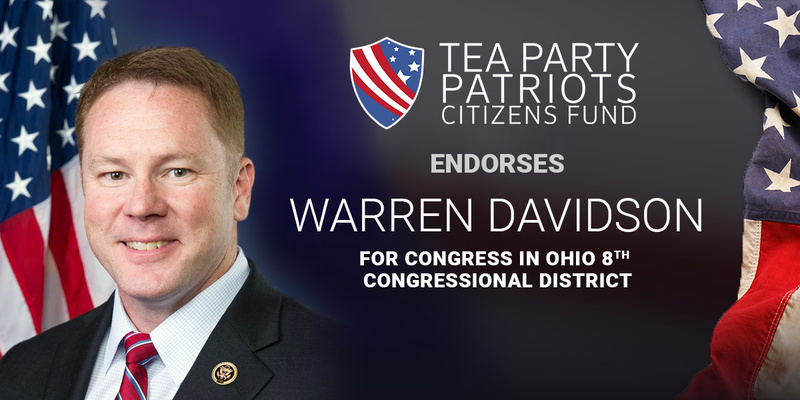 ATLANTA, Ga. – Tea Party Patriots Citizens Fund (TPPCF) Chairman Jenny Beth Martin today released the following statement, announcing that the Super PAC associated with the nation’s largest Tea Party group has endorsed Warren Davidson for Congress in Ohio’s 8th congressional district. “Since being elected to Congress in 2016, Warren Davidson has kept his promises. “Warren has fought to repeal ObamaCare, cut taxes to create economic growth and the better-paying jobs that go with it, and get federal spending under control. Despite pressure from the so-called ‘leadership,’ he showed the courage to stand up for his constituents and vote against that massive omnibus spending bill. “He has opposed amnesty for illegal immigrants, and wants to secure the border. “He’s been a strong supporter of the Second Amendment, and opposes efforts to limit the rights of gun owners. “And he’s been working hard to implement President Trump’s legislative agenda.